The Thuma Mina Campaign Soweto Tour took place on the 16th of February that saw ANC zone 4 coming together to tour South Africa’s largest township. 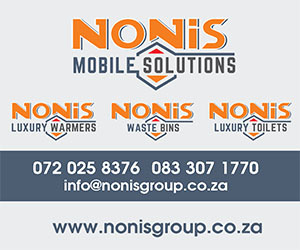 The tour was sponsored by Protea Glen based security company Base 5 Guard. Base 5 Guard Managing Director Lucky Moshimane had a one on one meeting with President Cyril Ramaphosa last year, this was when the president made the call for the Thuma Mina Campaign. Ramaphosa called on ANC activists and members to campaign using the “Thuma Mina” Message. The tour started very early in the morning, it saw ANC members meeting at Base 5 Guard offices located at Sizwe Shopping Centre for a briefing ahead of a lengthy day. In the briefing high ANC ranking officials were in attendance who also formed part of the tour and the door to door campaign for the ANC. The briefing started at 8 am witnessing Base 5 Guard Managing Director Lucky Moshimane and his wife Nhlanhla Moshimane delivering speeches. Nhlanhla Moshimane reading a speech on behalf of her husband praised the ANC for the work it has done since its existence. “Over the years, when I grew up within the struggle of our independence. I witnessed the struggle for our freedom from minority power to majority power. On these recent days I also witnessed the introduction of the Zondo Commission against corruption by the ANC.” Nhlanhla Moshimane said. She also acknowledged the legacy of previous South African Presidents like Jacob Zuma and Thabo Mbeki. After the briefing a tour bus with ANC members from Zone 4 travelled to various wards where door to door campaigning was done. President Cyril Ramaphosa’s sister was also visited and assured that the President will receive full support from local ANC members. 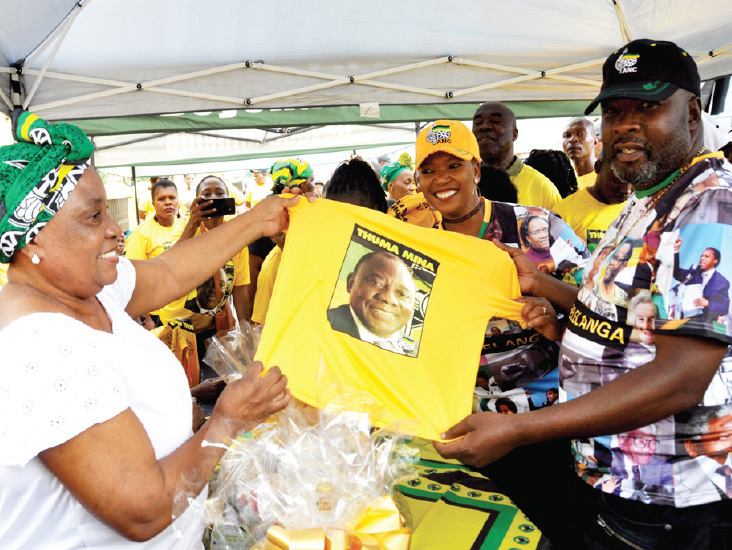 ANC t-shirts sponsored by Base 5 Guard were given to residents staying at the visited wards. Some residents even took off t-shirts of other political parties and were given ANC t-shirt to wear. 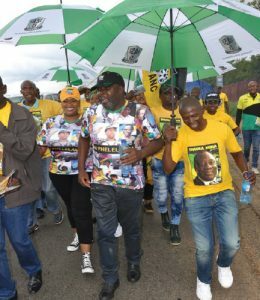 The Thuma Mina campaign is expected to continue in various areas country wide.